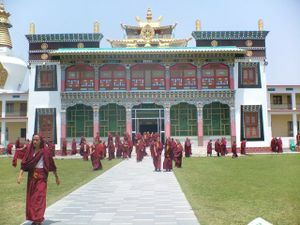 Orgyen Mindroling Monastery (Tib. ཨོ་རྒྱན་སྨིན་གྲོལ་གླིང་, Wyl. o rgyan smin grol gling) — one of the Six "Mother" Nyingma Monasteries. It was founded in 1676 by Minling Terchen Gyurme Dorje, aka Rigdzin Terdak Lingpa with his brother Lochen Dharmashri. 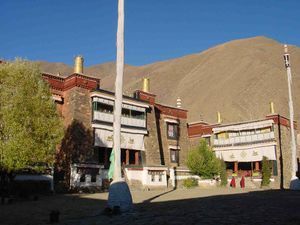 The monastery enjoyed a close association with the Fifth Dalai Lama, but was destroyed during the Dzungar war of 1717-8, during which Terdak Lingpa's younger brother, the great scholar Lochen Dharmashri was killed. Terdak Lingpa's daughter, Jetsün Mingyur Paldrön, fled to Sikkim and then returned to Mindroling, and together with her brother Drinchen Rinchen Namgyal, rebuilt the monastery, with the support of Polha Taiji. The heads of Mindroling are the hereditary successors of Minling Terchen. The last head, Minling Trichen Rinpoche, was the eleventh throneholder. Re-established near Dehra Dhun in India, Mindrolling Monastery is one of the largest active Buddhist centres today. This page was last edited on 2 February 2017, at 20:36.